British artist Gordon Cheung is featured at the ASU Art Museum in Altered States: Paintings by Gordon Cheung from the Stéphane Janssen Collection, his first solo exhibition in a U.S. museum. Altered States: Paintings by Gordon Cheung from the Stéphane Janssen Collection runs Jan. 9 – April 10, 2010 and features selected paintings as well as four new video works by the artist. 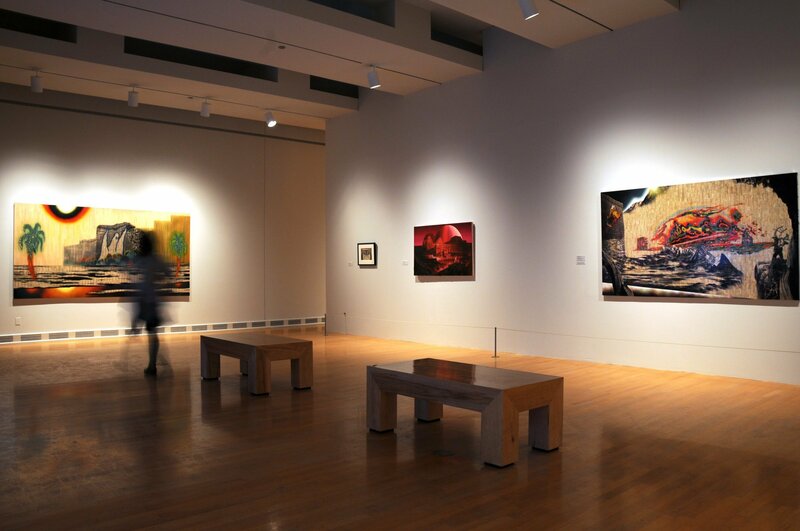 On Jan. 22, 2010, Cheung presents a free lecture in the ASU Art Museum’s Friday Conversations @11 series. While in Tempe, he also will meet with students and classes. Born to Chinese parents and raised in the urban environment of London, Cheung’s works traverse cultures, juxtaposing images, symbols and ideas from a diverse range of sources: news and popular media, video games, graffiti, architecture and historical paintings. Rather than focus on the original ideas presented in these sources, Cheung repurposes these images to highlight contemporary issues such as ecological destruction and capitalism and consumerism gone awry. At the same time, his works include motifs found throughout his prior work: oceans of numbers and financial data, and the bold use of color balanced alongside familiar contemporary images. In reference to some of the more recognizable paintings he has drawn from, Cheung has a distinct process. “I wasn’t choosing these (sources) consciously due to their historical significance, but rather responding to the ideas in the works that I felt were relevant to contemporary times and the themes that underlie all my work,” Cheung says.